FotoFacial RF with elos technology is a revolutionary, non-invasive treatment with no downtime. FotoFacial RF offers a safe, gentle alternative to redefine skin imperfections such as ruddy complexion, broken capillaries, spider veins, hyperpigmentation, freckles, sun damage and more. You can expect that deep lines feel softer, skin feels tighter, healthier and more rejuvenated. Photo Rejuvenation is a series of Intense Pulsed Light (IPL) treatments that improve the appearance of rosacea, flushing and sun-damaged skin, age spots, skin texture, and photoaging. This treatment also improves the appearance of mild acne scars, reduces large pores, corrects dark circles around the eyes, and reduces fine lines. Additionally, this exhilarating treatment involves little or no downtime. An intense light is applied as a series of gentle pulses to the treatment area. Without damaging the skin, the light penetrates the skin and is absorbed by the abnormally dilated vessels or pigmentation. Heat then impairs the targeted vessel or lesions, and the body begins a natural healing process. Lesions darken before they flake off or are absorbed. Treatments can take place about every 2-3 weeks. For optimal results, a series of 3-5 treatments are recommended. Some patients see significant improvement in two to three treatments while others might require more. Follow-up treatments may be needed once a year to maintain desired results. Treatments can be performed on the face, neck, chest, hands arms and legs. Each treatment session takes about 45 minutes depending on the amount of area covered. A cool numbing gel is placed on the skin for 20 min prior to treatment to minimize discomfort. Side effects are rare. Right after treatment, the skin may appear flushed, brown pigmented spots may appear darker, and capillaries may be more visible. What Is The Cost of IPL? Pricing varies according to the amount of area treated. Each session ranges in pricing from 75.00 (small spot treatment) to 700.00 (legs and arms). 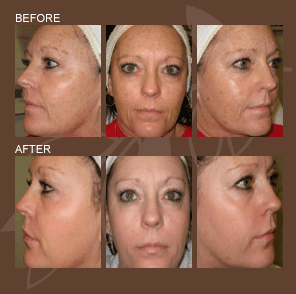 An IPL to full face starts at 250.00 – 300.00 per session.